Defending V.League Champions Hanoi FC went to the top of the league this weekend after they demolished Song Lam Nghe An 4-0. Two goals in the first 20 minutes from Ganiyu Oseni and Pape Omar Faye gave the side a comfortable lead at the break, before goals from Samson and Quang Hai rounded off the match. The capital club have now collected 10 points from their opening four games. Elsewhere, the winning streak of Ho Chi Minh City FC came to an end as they were held in a goalless draw against Saigon FC. This result meant the side dropped their first points of the season, allowing Hanoi to take their place on top of the league. At the bottom of the table, Sanna Khanh Hoa gained their first win of the season with 2-1 win over Nam Dinh. CentCenterk Dao Van Phong and striker Oliveira appeared on the scoresheet for the visitors, while young attacker Mai Xuan Quyet scored the consolation goal for Nam Dinh. 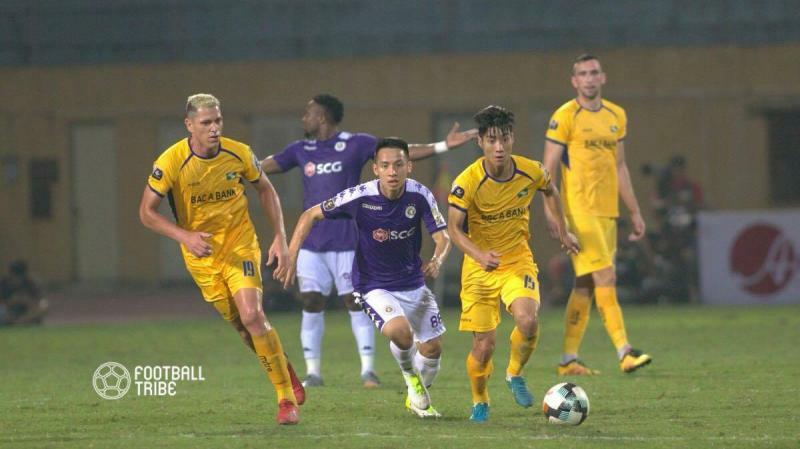 Thanh Hoa FC fell down to last place with a goaless draw against SHB Da Nang, despite the opponents having only 10 players on the field for last 15 minutes after Pham Manh Hung’s red card. Last year’s runners-up now have only 2 points after 4 matches.